You might say it can happen just about anywhere. Sitting on a hillside watching the sun lay its head down after a long day, the quiet surrounding you tighter and tighter as it grows dark, or sitting on a rock at water’s edge as the waves come in to greet you. Peace. Center. This is what it’s all about it, as you struggle through the days feeling pulled in all directions – and for what? To have a few moments like this, where we find what we’re looking for within ourselves. It takes the beginning or the end of something to put it all into perspective. The constant motion of water, the sun coming up in the morning to start the day or the sunset to put an exclamation point at the end of another day in our lives. We seek these few precious seconds out of a day that has only so many to choose from. But we find them – they’re just mixed in with all the rest. Even the clear sky, lit from a full moon, can give us pause. 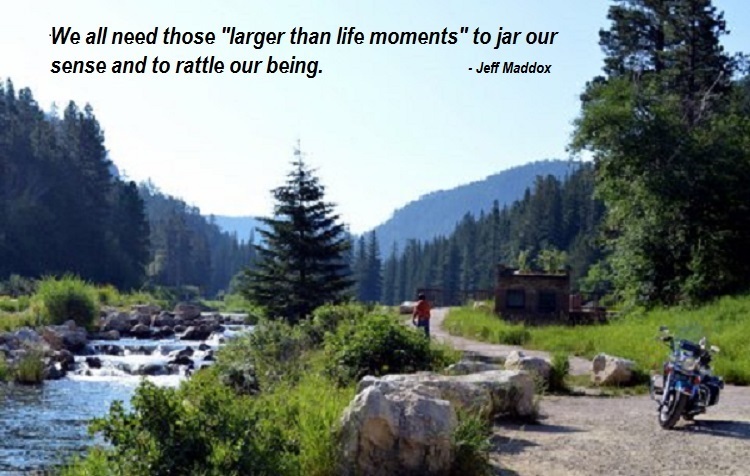 We often feel the need to see something bigger than ourselves to jar our senses and rattle our being. I find a lot of these necessary fragments of time from behind the handlebars of my motorcycle. It’s a combination of direction, smells, sights and sounds that put me in my place. Life is so much bigger than the road I’m on. I’ve seen the power of a storm as I’m heading right into it – and the rainbow that follows. It’s only water, right? 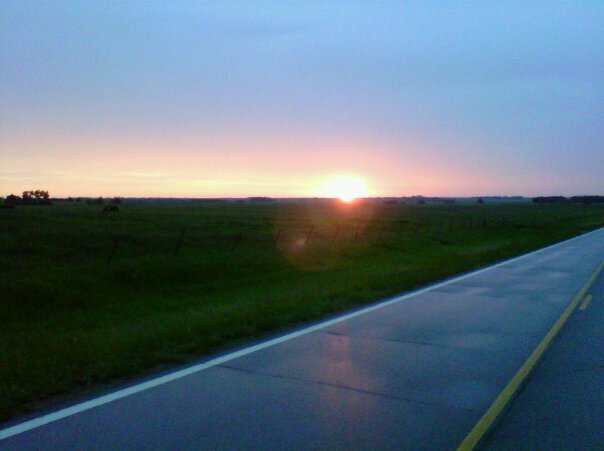 I often talk of the sun coming up in my mirror as I head West, or the sun setting as I roll down the highway, but mere words can’t do it justice. It’s an attitude of humility that surfaces and suddenly it’s me who becomes those precious few seconds in time. I’ve been on this planet for fifty-plus years, but to this planet my life is the equivalent to the blink of an eye. I need these “larger than my life” moments to set me straight, but it isn’t always nature that causes it. The faces of my grandchildren can bring even the most difficult day to its knees and it makes me realize that those few precious seconds we have are just that – few and precious. So whether it’s from the seat of your motorcycle, hands and knees dirty from the garden or standing perfectly still as the evening comes; take it all in as it’s only a blink of an eye. Jeff, this is really nice … I especially love that last paragraph. Children, garden, motorcycle … the blink of an eye. I also find that I ‘get’ many moments while out on the bike. More really than walking the dog in the woods or strolling on the beach. I wonder what it is about the bike. I guess you have to be more aware of everything when riding? There is truly something moving about riding a motorcycle. I’m sure those who find passion in other things can compare this feeling we have but the emotion we feel while riding brings it all together. Thanks for reading and I hope you guys are ready for your trip!